21. The Danube River basin is relatively rich in water resources, but this richness is not evenly spread, and there are significant differences among different parts of the basin. The Danube River basin is the second-largest river basin in Europe, covering 801,463 km2, with a total of 81 million people in 19 countries. 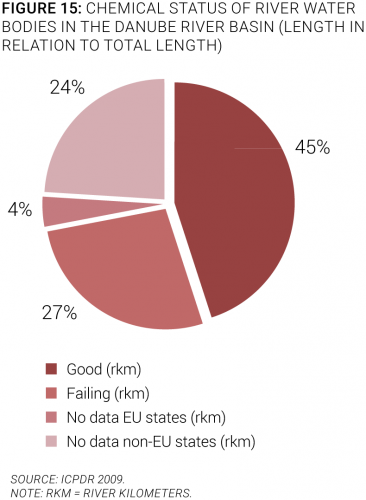 Sixteen of the 19 countries are covered in this report (Germany, Italy, and Switzerland are excluded because they are not typically associated with the Danube region countries, as such). Due to its large breadth from west to east, and diverse landscape, the Danube River basin evidences great differences in water resources and climate. The Danube connects with 27 large and over 300 small tributaries from its spring in the Black Forest in Germany to the Black Sea in Romania, and as such is the largest water basin in the EU. 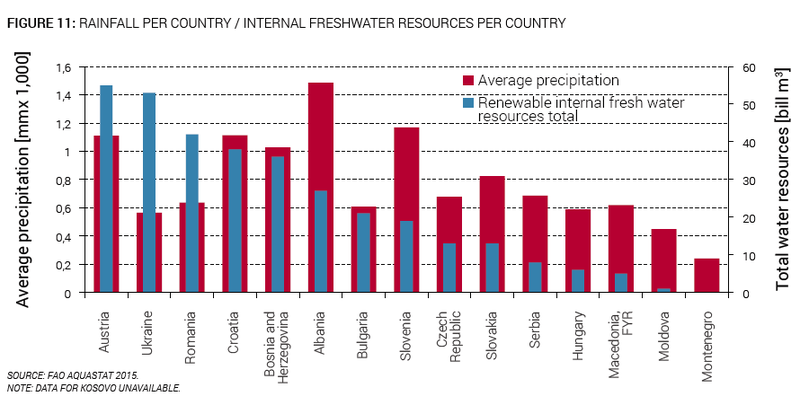 The region is rich with renewable water resources, but there are still major differences in availability of these resources in different parts of the region, ranging from more than 24,000 m3 per capita per year in Croatia, to 1,250 m3 per capita per year in the Czech Republic (Figure 10). 22. 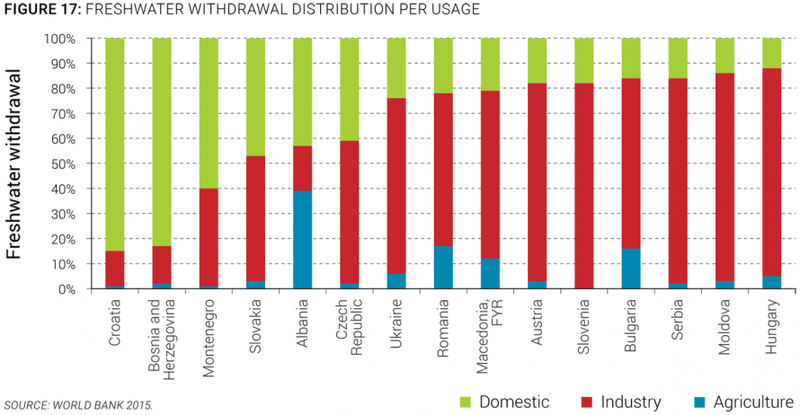 Only one country in the basin, the Czech Republic, can be qualified as water stressed. The most widely used measure for scarcity of water is the Falkenmark indicator or Water Stress Index (Falkenmark, Lundqvist and Widstrand 2009), which uses 1,700 m3 of renewable water resources per capita per year as the threshold (based on estimates of water requirements in the household and in the agricultural, industrial, and energy sectors). Measured by that indicator, of all the countries in the Danube River basin, only the Czech Republic can be qualified as water stressed. At the same time, no country in the Danube River basin falls below the “water scarcity” threshold of 1,000m3, again emphasizing the solid availability of renewable water resources in the region compared to other parts of the world. 23. Rainfall in the region is only moderately seasonal and dependent on predominant climatic conditions. The regional rainfall distribution shows a strong influence of different climates, which change from Continental to Mediterranean depending on the part of the basin, and range from less than 300 millimeters (mm) to more than 1,400 mm per year. 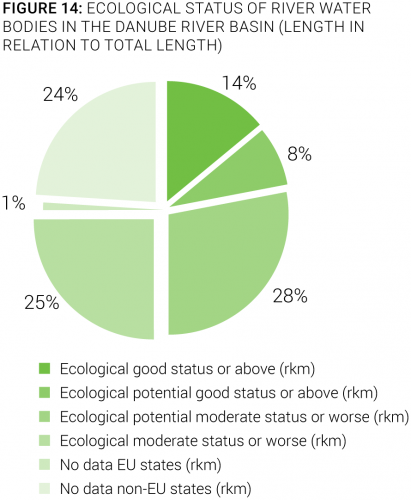 This has a major impact on the variation of renewable freshwater resources, as seen in Figure 11. 24. The impact of climate change in the region is visible through changes in the hydrological cycle, leading to an increasing occurrence of extreme weather conditions, from droughts to high waters and rainfalls. Since the Danube region has mostly moderate climate, with a relatively balanced variation of rainfalls, the adverse effects of climate change have so far been only moderate. Based on findings of the Climate Change Adaptation study (LMU 2012) for the International Commission for the Protection of the Danube River (ICPDR), the main impacts on water-related sectors are triggered by temperature and precipitation changes, including (a) an increase in air temperature with a gradient from northwest to southeast, particularly in summer in the southeastern Danube region; (b) overall small annual precipitation changes for the whole basin on average, but major seasonal changes in the Danube River basin; (c) changes in the seasonal runoff pattern, triggered by changes in rainfall distribution and reduced snow storage; (d) the likelihood that droughts, low flow situations, and water scarcity will become longer, more intense, and more frequent; and (e) an increase in water temperature and increased pressures on water quality (Figure 12 and Figure 13). 25. Potential damage to water sector provision due to climate change ranges from damage to infrastructure to revenue loss. Due to their dependence on regular, expected rainfalls, and temperature-dependent consumption, water services are sensitive to climate change, droughts, and lower groundwater tables, and potential drinking water shortages are sensitive to extreme rainfalls and floods. Resulting from the above-mentioned negative impacts of climate change, the major vulnerabilities of water supply and sanitation (WSS) are expected to include (a) drinking water shortages due to droughts and groundwater table lowering, (b) water quality issues due to extreme droughts or rainfalls, and (c) damage to residential and industrial WSS infrastructure due to extreme weather events. The damage assessment following the May 2014 floods in the Sava catchment area illustrates the destructive force of floods on man-made infrastructure, but also the relative resilience of water supply and sanitation infrastructure, since most of the systems were back in operation in few weeks’ time. 26. While almost all countries in the region have made progress preparing climate change response strategies and adaptation activities, implementation of concrete adaptation measures is still lacking in most of the countries. Most countries have prepared and adopted national climate change strategies that are analyzing potential impacts, and considering possible mitigation measures. Of the 16 countries analyzed for this report, 9 have adopted water strategies that deal with or include climate change impacts, 6 are preparing such documents, and only 1 (Bosnia and Herzegovina) has not yet started preparing a climate change impact assessment (SoS data collection). This indicates a relatively high level of climate change awareness in the Danube region. However, almost all countries in the region are still focusing their activities on analysis and preparation of strategic documents, while transposition of adoption measures into different water standards, or introduction of climate change into future development projections and plans, is still pending. The water services sector sensitivity toward climate change became evident following extreme rainfalls and large floods in parts of the region during May and August 2014, which resulted in loss of life and widespread damage in the Sava River basin, including damage to water supply and sanitation infrastructure (around 1 million people were left without access to drinking water for several days). However, a damage assessment done after the event also showed that basic water services were mostly restored after two to three weeks, and that water sector damage accounted for just 0.7 percent of total damage. 27. The quality of surface waters has remained the focus of activities over the last few decades, and while improvement is visible, overall good water status has not yet been achieved in significant parts of the basin. Industrial activities and large population concentrations are responsible for the relatively high level of organic pollutants and nutrients (nitrogen and phosphorus) discharged into the waters of Danube River basin. The loads of organic pollution in surface waters are still high in some parts of Danube and in most of the Danube River tributaries (results for the whole Danube River basin area are presented in Figure 14 and Figure 15). This is the consequence of still considerable discharge of untreated or insufficiently treated wastewater from municipal, industrial, and agricultural sources, in particular in the lower part of the basin, where there are new or non-EU countries located. The analysis prepared under the ICPDR shows that in the last two decades, there have been considerable improvements in water quality in the Danube River basin. This could be attributed to the high level of investments in wastewater treatment, made mostly under the EU accession agenda, and a significant decline of industry and agricultural activities in the post-socialist period. However, the main nutrient pollution sources in the Danube River basin remain agriculture (50 percent), followed by municipal wastewater (25 percent) and industry (25 percent) (ICPDR 2009). 28. Groundwater is the dominant source for water supply in large parts of the region. While both surface and groundwater are well represented as sources of water supply, groundwater is the dominant source of drinking water (Figure 16). Seventy-two percent of the drinking water in the region is produced from groundwater. However, the share of groundwater used for drinking water purposes is very different among countries of the region and ranges from 30 percent to 50 percent in the southeast part of the region, to close to 100 percent in the northwest part (Figure 16). 30. Water management in the Danube River basin is driven by the principles of the EU Water Framework Directive (WFD) under the auspices of the ICPDR. The ICPDR was established in 1998 on the basis of the Danube River Protection Convention, the major legal instrument for cooperation and transboundary water management in the Danube River basin, and the platform for implementation of all transboundary aspects of the EU WFD. With support from the ICPDR, the 19 countries of the Danube watershed have elaborated a Danube River Basin Management Plan in conformity with the WFD. The plan was first adopted in 2009 and is being updated jointly by all countries in 2015, in conformity with the WFD’s six-year timeline. Its purpose is to establish a framework for the protection and enhancement of the status of inland surface and groundwater, and to ensure sustainable use of water resources, and aims to ensure that all waters meet “good status,” which is the ultimate objective of the WFD.